Well it's been a very long time since I last blogged. A little harder to keep up with this when I no longer have a garden. I've been doing a lot of hiking and camping in the last 6 months. Perhaps more on that later. But since it's Fall and Thanksgiving is approaching I thought I'd post about my current attempt to eat acorns for the first time. I attempted to harvest some last year, but got to it too late and basically got a small amount of wormy acorns. Not fun. This year I was a lot luckier. I was able to collect acorns from both the California Black Oak (Quercus keloggii) and the Valley Oak (Quercus lobata). 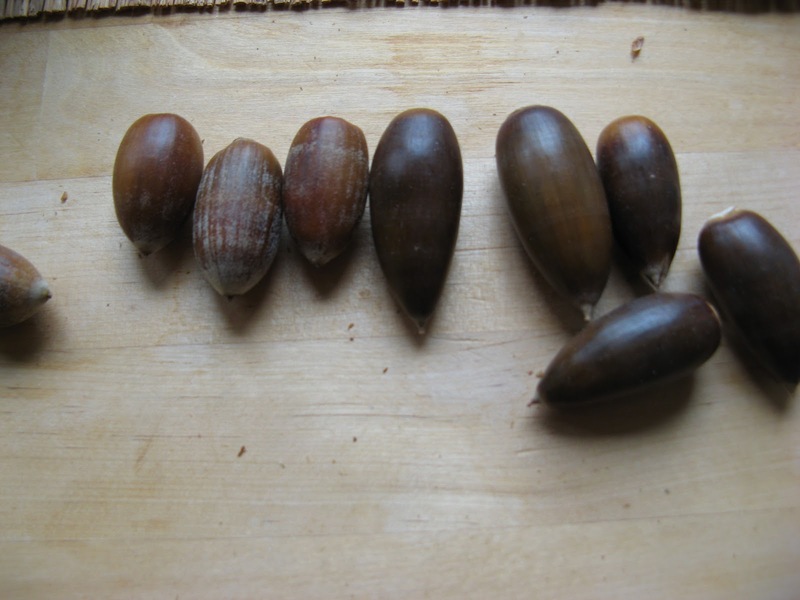 *The common names are often used in other regions to refer to different oaks* As you can see from the picture the acorns look very different. The black oak acorns are on the left above. They are much smaller and rounder. The valley oak acorns on the right are much longer and bigger. And once they are cracked they are very different as well. Just to confuse you all, in the bowls, the shelled valley oak acorns are now on the left and the black oak acorns on the right. 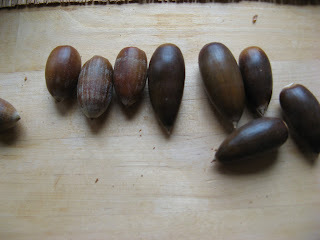 The black oak acorns have a very difficult to remove skin. Especially hard with undersized acorns of which I had more than my fair share. I read somewhere to sprinkle them with water, let them dry and then rub the skins off. I had to do this twice, but it definitely helped speed up the process. Then into my spice grinder and the flour (which smells really nice) into a jar with some cold water. And into the fridge. You have to leach the tannins out of acorns to make them safe to eat. More on my adventures in leaching the acorn flour in my next post.